The Ogallala Aquifer occupies the High Plains of the United States, extending northward from western Texas to South Dakota. The Ogallala is the leading geologic formation in what is known as the High Plains Aquifer System. The entire system underlies about 450,000 square kilometers (174,000 square miles) of eight states. Although there are several other minor geologic formations in the High Plains Aquifer System, such as the Tertiary Brule and Arikaree and the Dakota formations of the Cretaceous, these several units are often referred to as the Ogallala Aquifer. 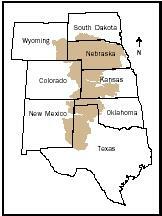 The Ogallala Aquifer (shaded area) is in a state of overdraft owing to the current rate of water use. If withdrawals continue unabated, the aquifer could be depleted in only a few decades. between the mountains and the existing western boundary of the Ogallala, so there is no longer water recharge being received from the Rockies. The Ogallala is an unconfined aquifer, and virtually all recharge comes from rainwater and snowmelt. As the High Plains has a semiarid climate, recharge is minimal. Recharge varies by amount of precipitation, soil type, and vegetational cover and averages less than 25 millimeters (1 inch) annually for the region as a whole. In a few areas, recharge from surface water diversions has occurred. Groundwater does flow through the High Plains Aquifer, but at an average rate of only 300 millimeters (12 inches) per day. The depth to the water table of the Ogallala Aquifer varies from actual surface discharge to over 150 meters (500 feet). Generally, the aquifer is found from 15 to 90 meters (50 to 300 feet) below the land surface. The saturated thickness also varies greatly. Although the average saturated thickness is about 60 meters (200 feet), it exceeds 300 meters (1,000 feet) in west-central Nebraska and is only one-tenth that in much of western Texas. Because both the saturated thickness and the areal extent of the Ogallala Aquifer is greater in Nebraska, the state accounts for two-thirds of the volume of Ogallala groundwater, followed by Texas and Kansas, each with about 10 percent. The Ogallala Aquifer, whose total water storage is about equal to that of Lake Huron in the Midwest, is the single most important source of water in the High Plains region, providing nearly all the water for residential, industrial, and agricultural use. Because of widespread irrigation, farming accounts for 94 percent of the groundwater use. Irrigated agriculture forms the base of the regional economy. It supports nearly one-fifth of the wheat, corn, cotton, and cattle produced in the United States. Crops provide grains and hay for confined feeding of cattle and hogs and for dairies. The cattle feedlots support a large meatpacking industry. Without irrigation from the Ogallala Aquifer, there would be a much smaller regional population and far less economic activity. 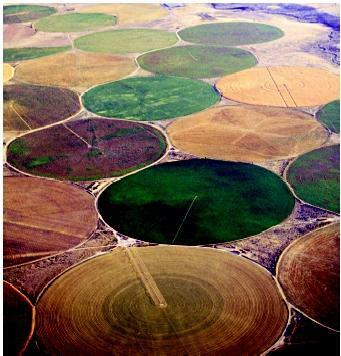 Because of the Ogallala, the High Plains is the leading irrigation area in the Western Hemisphere. Overall, 5.5 million hectares (nearly 13.6 million acres) are irrigated in the Ogallala region. The leading state irrigating from the Ogallala is Nebraska (46%), followed by Texas (30%) and Kansas (14%). Slowing the Rate of Depletion. The Ogallala Aquifer is being both depleted and polluted. Irrigation withdraws much groundwater, yet little of it is replaced by recharge. Since large-scale irrigation began in the 1940s, water levels have declined more than 30 meters (100 feet) in parts of Kansas, New Mexico, Oklahoma, and Texas. In the 1980s and 1990s, the rate of groundwater mining , or overdraft, lessened, but still averaged approximately 82 centimeters (2.7 feet) per year. Center-pivot sprinklers are among the irrigation methods used in the High Plains. Large quantities of groundwater pumped from the Ogallala Aquifer allows these semiarid western lands to yield abundant harvests. in reduced irrigation in areas with limited saturated thickness and increased energy cost in all areas as the depth to water increases. The average specific yield for the High Plains Aquifer is about 0.15. This means that only 15 percent of all the water available in the aquifer can be recovered using irrigation pumps, while the rest remains unused and locked up in the unsaturated zone . Groundwater depletion problems could be forestalled if this presently nonrecoverable water could be forced to the saturated zone . One experimental means of accomplishing this is by injecting air into the unsaturated zone, which breaks down capillary action and permits the movement of water down to the saturated zone. Air injection experiments have shown positive results for very localized areas. However, the widespread applicability of this technology has not yet proven effective. Groundwater contamination in the Ogallala became an issue in the 1990s. In its natural state, the High Plains Aquifer is, for the most part, of high quality. The water is generally suitable for domestic use, stock watering, and irrigation without filtration or treatment. Surveys of groundwater samples have detected traces of pesticides and nitrates. Sources include irrigated agriculture and confined livestock feeding operations. The percolation rates of contaminants from the surface to the water table have not been established in the areas where polluted water has been found. The future economy of the High Plains depends heavily on the Ogallala Aquifer, the main source of water for all uses. The Ogallala will continue to be the lifeblood of the region only if it is managed properly to limit both depletion and contamination. SEE ALSO Agriculture and Water ; Aquifer Characteristics ; Groundwater ; Irrigation Management ; Sustainable Development . Kromm, David E., and Stephen E. White, eds. Groundwater Exploitation in the High Plains. Lawrence: University Press of Kansas, 1992. Sophocleous, Marios, ed. Perspectives on Sustainable Development of Water Resources in Kansas. Lawrence: Kansas Geological Survey, 1998. White, Stephen E., and David E. Kromm. "Local Groundwater Management Effectiveness in Colorado and Kansas Ogallala Region." Natural Resources Journal 35 (1995):275–307. T.Boone Pickens plans to transport water from the Texas panhandle to metropolitan Dallas/FT Worth. Texas has water laws that allow that. He needs to form a water district to construct an 800 mile 8' diameter pipe. Think that won't affedt the Ogallala? Need to figure out a way to recharge the aquifer. Billions of gallons of water discharge into the sea every year. I just wanted to say thank you for having this site with all of this infomation. One of my high school teachers assigned this huge assignment to find out what the ogallala aquifer was and why it was important, and in this article, it has everything I need to know! So thank you for making my school work so much easier! Now I have enough time to do my school work and play with my son! Once again, Thank You! Though they alone cannot replace but little of the depleted water in the Ogallala Aquifier, a few people are trying to restore a number of the playas that no long work as they should to send water to the Ogallala Aquifier, according to articles I have read in the Amarillo GLOBE NEWS in the past several months. Why is it effing in danger? this is a fantastic article. it gave me and my pals the accurate information that we were needing for our extra credit summer project. i used this site once before for my first summer project and found it very insiteful. thank you for this information on the Ogallala Aquifer. Where I live in west central Nebraska, it is 600 feet down to the Brule Formation, according to the data from the monitoring well they drilled on our property. Their goal is to sink a well, in a grid, every 6 miles to see how deep it is, and to monitor the levels of ground water. For the last several years, the groundwater is as high as 2 ft. above the floor of my basement, altho it is about 70 ft. to good gravel when putting down a well. One truth that noone seems to comprehend is that there is the same amount of water on this earth as the day it was created. Water is not "disappearing". Water that irrigates someone's field sinks into the earth to recharge another area. Water that runs into the ocean percolates underground and eventually recharges the groundwater. It is probably true that center pivot irrigators are pumping it out faster than Mother Nature can recycle. It would help that situation if the government quit subsidizing farmers. Politicians with an agenda would have us believe that it is "Climate Change"!! And now there's this news: In new water test results released by the EPA yesterday (11/09/11), high levels of cancer-causing compounds and at least one chemical commonly used in hydraulic fracturing were found in the Ogallala Aquifer. A story published at MSNBC says, "The wells also contained benzene at 50 times the level that is considered safe for people, as well as phenols -- another dangerous human carcinogen -- acetone, toluene, naphthalene and traces of diesel fuel." So much for the Ogallala Aquifer. Once it's contaminated, it's useless. Thank your local EPA-bashing, anti-regulation Republican representatives for placing profits above health. Under Romney-Ryan, government agencies like USGS, EPA and others will be shut down to allow the private sector to further deplete the environment. As it now stands USGS program for Earth science space vehicles comes to an end in 2020...the ability to monitor the degradation of the Earth will come to an end. Wake-up Amurica!! After watching Ken Burn's special on the Dust Bowl on PBS this week, I see we are dooming ourselves to a repeat of history. We look back now at the farmers of 50 years ago and say "how stupid could they be?" 50 years from now people will look back on us and ask the same question. I've lived in Nebraska all of my life and heard my farmer father tell stories of the dust bowl days and how hard it was. I had no idea that the vast expansion of farming was largely responsible for creating the conditions. Only now instead of just spoiling the land, we're ruining and depleting our most precious resource. Please, we need to stop this insanity. As of today, 75% of Nebraska is in a deep, extreme drought. The aquifer survived 50 years ago because we hadn't yet figured out how to tap into it. How can it survive this time around if the drought lasts 10 years as it did in the 1930's?